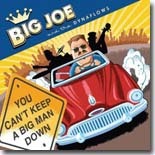 We've got a really hot one for our February Pick Hit --- so good, in fact, that two reviewers raved about You Can't Keep A Big Man Down from Big Joe and the Dynaflows. Trampled Under Foot's career has been on the upswing ever since this family band from Kansas City won the International Blues Challenge a few years ago. Their latest disc, Wrong Side of the Blues, is this month's Surprise feature CD. This month's Flashback covers a "Best of" collection from Alligator Records featuring the music of Shemekia Copeland. Our What's New section features new releases from Todd Sharpville, Joanne Shaw Taylor, Kenny Neal, the late Robin Rogers, Lara Price, Ron Tanski, Big Shanty, Todd Wolfe Band, Paul Pigat, Patrik Jansson Band, and more.